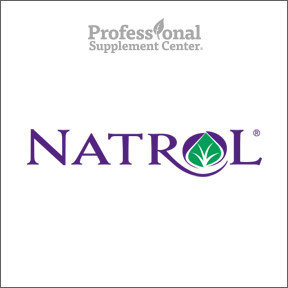 Professional Supplement Center now carries Natrol®, a line of nutritional supplements known for their high quality products and extensive quality assurance program. Manufactured for over 35 years under Good Manufacturing Practices (GMPs), Natrol is committed to providing pure, safe and effective products to better support health and wellness. From their strict vendor qualification program, to analytical ingredient testing, to in-process testing, to final finished product testing, Natrol® guarantees that all products meet stringent quality specifications and ensures efficacy through the expiration date. Their uncompromised quality standards and diligent testing ensure truth in labeling throughout product shelf life. Pycnogenol 50 mg – 20% OFF This clinically tested, potent, natural antioxidant is derived from the bark of the French maritime pine tree, rich in oligomeric proanthocyanadins, bioflavonoids and phenolic acids. These premium antioxidants are believed to support cardiovascular, skin and circulatory heath, and provide free radical defense for total body health. Gluten, soy, dairy and yeast free formulation. Omega-3 Flax Seed Oil 1000 mg – 20% OFF This product provides natural plant-sourced alpha linolenic acid (ALA), an omega-3 essential fatty acid that plays a role in supporting cellular, cardiovascular and overall health. Gluten, soy and dairy free formulation. Easy-C with Bioflavonoids 1000 mg – 20% OFF This easy on the stomach, high potency antioxidant vitamin C and citrus bioflavonoid complex provides free radical protection and supports overall wellness. Gluten, soy, dairy and yeast free vegetarian formulation. Stress & Anxiety / Day & Nite Formula – 20% OFF This calming day and night formula provides clinically validated, non-habit forming ingredients to help manage stress, reduce anxiety, promote relaxation and support restful sleep. Gluten, soy and dairy free formulation. Cinnamon Extract 500 mg – 20% OFF Derived from cinnamon bark, this product contains naturally occurring antioxidant polyphenols, and supports glucose metabolism and the maintenance of healthy blood sugar levels already within the normal range. Gluten, soy, dairy and yeast free, vegetarian formulation. This entry was posted in Home and tagged Natrol, Omega-3 Flax Seed Oil 1000 mg, Professional Supplement Center, Pycnogenol 50 mg, Vitamins and supplements, www.professionalsupplementcenter.com. Bookmark the permalink.